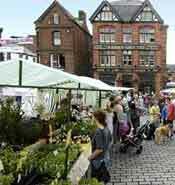 Penrith farmers market offers a tempting array of local specialities, seasonal produce and distinctive crafts, all within the heart of the town. Filled with attractive colourful stalls and fresh local food, you can also learn where things come from and how they’re grown or made. The stallholders, a number of whom are award-winning producers, are also keen to offer a wealth of food know-how and recipes for their produce. With its individual specialist shops, varied eating places and ample parking nearby, a visit to the historic market town of Penrith is well worth adding to your shopping list.